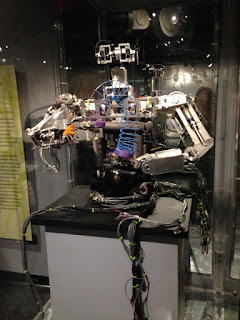 We just got back from Boston, where we attended out third Scratch conference. It was lots of fun to be back at MIT, and meet up with everyone, including lots of people we met in Amsterdam last year. Officially we had a poster, and were talking about Banana Physics which I've written about here already. Here's an updated PDF with our slides. Thanks to Andy for his help on the stand, and spreading the word. We also showed off our online editor: live.sniff.org.uk. This is very experimental, but is working well - its the fastest, and easiest way to get started with Sniff, as there are installs required - It all runs in the browser (and compiles on our server), so you can just make an account, and start programming. In the future we hope to be able to support local hardware with a small browser plugin. We'll have a dedicated post on this very soon, and making bigger announcement, as it is a big thing. The Colour Divide: https://scratch.mit.edu/projects/71447764/ is a great animation done in Scratch by bubble103 (who was an invited speaker at the conference as a result - aged 16!). As someone who works full time in the computer animation field, I generally don't get that excited by Scratch animations, but this is a great piece of work that deserves all the recognition its getting. There were a lot of students from Warwick techvolenteers who are doing a lot of great schools outreach doing science projects much like we've been building in Sniff, though they were showing off work aimed at slightly younger kids. They've just transitioned from Picoboard to a custom Arduino shield, which we hope to get a good look at soon. We finally got hands on with the wedo2, and it was as much a let down as we expected. Driver compatabilities, HW limitations on about 50% of the laptops, binding problems and battery requirements all make it a pretty unconvincing upgrade. While we didn't do any serious testing it seemed like the motor was lacking in torque, and struggled to handle gearing well. Maybe in the future things will get better, but right now we'll hang on to Wedo V1.0 (or better yet Control Centre B). There were a couple of companies showing of their robot buggies. Dexter Industries had a session on their GoPiGo, which is a lot like our SniffBotJr that we use for workshops. However unfortunately its based around a Pi, which means it costs $210 for their starter kit. 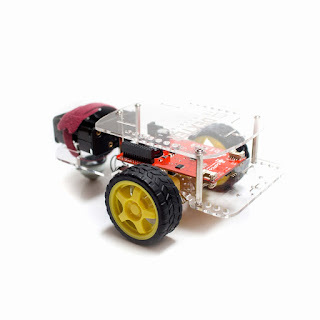 The robot kit from ROBBO costs about the same at 250Euros and is Arduino based, which is a lot of money for an Arduino based robot, but it is beautifully made. The sensors attach magnetically providing both physical and electrical connections to both digital and analog pins, which is incredibly clever. The sensors just clip on, so you can reconfigure in seconds and they're physically polarised by the shape cut in the acrylic housing, so its impossible to connect them incorrectly. 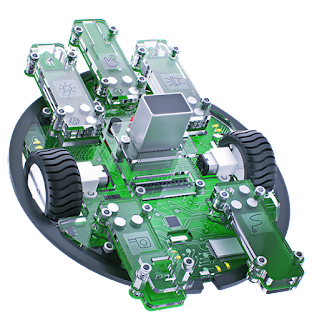 We spend a chunk of time on Friday night, and Saturday afternoon playing with both their robot, and their "lab kit" (an arduino powered pico board style device), and they are sweet if your budget can handle them. Both work out of the box with Sniff (once we figured the pins being used) - program them using the nano-sniff command, and they work great. 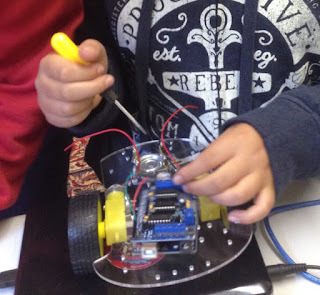 If I can make it to the conference next year I think we'll run a workshop on building a real low cost robot - we spend about £25 per robot to cover hardware costs on our workshops, which means every student gets to build a robot, and take it home with them! Check the "Robot" posts here on the blog to see what we've built, and information on how to build your own, or just get in touch if you need help. Finally Derek Breen (no fixed abode - coming to a sofa near you soon) has a couple of "new" books - well not really... he's quite open that they're cut down rehashes of is original Scratch for Kids book, but they're smaller, and focus on specific things: one on animation and on one games, which means they're much more approachable for a kid with a specific interest. And then it was over - a quick stop at the MIT Museum and we were back on a plane to the UK - missing the Delta datacenter outage but a few hours!